A black hole is an object or region of space where the pull of gravity is so strong that nothing can escape from it, i.e. the escape velocity exceeds the speed of light. The term was coined in 1968 by the physicist John Wheeler. However, the possibility that a lump of matter could be compressed to the point at which its surface gravity would prevent even the escape of light was first suggested in the late 18th century by the English physicist John Michell(c.1724-1793), and then by Pierre Simon, Marquis de Laplace (1749-1827). Black holes began to take on their modern form in 1916 when the German astronomer Karl Schwarzschild (1873-1916) used Einstein's general theory of relativity to find out what would happen if all the mass of an object were squeezed down to a dimensionless point – a singularity. He discovered that around the infinitely compressed matter would appear a spherical region of space out of which nothing could return to the normal universe. This boundary is known as the event horizon since no event that occurs inside it can ever be observed from the outside. Although Schwarzschild's calculations caused little stir at the time, interest was rekindled in them when, in 1939, J. Robert Oppenheimer, of atomic bomb fame, and Hartland Snyder, a graduate student, described a mechanism by which black holes might actually be created in the real universe. A star that has exhausted all its useful nuclear fuel, they found, can no longer support itself against the inward pull of its own gravity. The stellar remains begin to shrink rapidly. If the collapsing star manages to hold on to a critical amount of mass, no force in the Universe can halt its contraction and, in a fraction of a second, the material of the star is squeezed down into the singularity of a black hole. In theory, any mass if sufficiently compressed would become a black hole. The Sun would suffer this fate if it were shrunk down to a ball about 2.5 km in diameter. In practice, a stellar black hole is only likely to result from a heavyweight star whose remnant core exceeds theOppenheimer-Volkoff limit following a supernova explosion. More than two dozen stellar black holes have been tentatively identified in the Milky Way, all of them part of binary systems in which the other component is a visible star. A handful of stellar black holes have also been discovered in neighboring galaxies. Observations of highly variable X-ray emission from the accretion disk surrounding the dark companion together with a mass determined from observations of the visible star, enable a black hole characterization to be made. 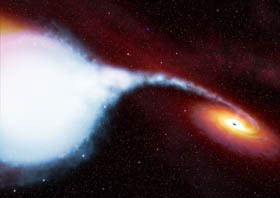 Among the best stellar black hole candidates are Cygnus X-1, V404 Cygni, and several microquasars. The two heaviest known stellar black holes lie in galaxies outside our own. One of these black hole heavyweights, called M33 X-7, is in the Triangulum Galaxy (M33), 3 million light-years from the Milky Way, and has a mass of 15.7 times that of the Sun. Another, whose discovery was announced in October 2007, just a few weeks after that of M33 X-7, is called IC 10 X-1, and lies in the nearby dwarf galaxy, IC 10, 1.8 million light-years away. IC 10 X-1 shattered the record for a stellar black hole with its mass of 24 to 33 times that of the Sun. Given that massive stars lose a significant fraction of their content through violent stellar winds toward the end of their lives, and that interaction between the members of a binary system can further increase the mass loss of the heavier star, it is a challenge to theorists to explain how any star could retain enough matter to form a black hole as heavy as that of IC 10 X-1. The microquasar V4641 Sagittarii contains the closest known black hole to Earth, with a distance of about 1,500 light-years. Supermassive black holes are known almost certainly to exist at the center of many large galaxies, and to be the ultimate source of energy behind the phenomenon of the active galactic nucleus. At the other end of the scale, it has been hypothesized that countless numbers of mini black holes may populate the universe, having been formed in the early stages of the Big Bang; however, there is yet no observational evidence for them. In 2002, astronomers found a missing link between stellar-mass black holes and the supermassive variety in the form of middleweight black holes at the center of some largeglobular clusters. The giant G1 cluster in the Andromeda Galaxy appears to contain a black hole of some 20,000 solar masses. Another globular cluster, 32,000 light-years away within our own Milky Way, apparently harbors a similar object weighing 4,000 solar masses. Interestingly, the ratio of the black hole's mass to the total mass of the host cluster appears constant, at about 0.5%. This proportion matches that of a typical supermassive black hole at a galaxy's center, compared to the total galactic mass. If this result turns out to be true for many more cluster black holes, it will suggest some profound link between the way the two types of black hole form. It is possible that supermassive black holes form when clusters deposit their middleweight black hole cargoes in the galactic centers, and they merge together. According to the general theory of relativity, the material inside a black hole is squashed inside an infinitely dense point, known as a singularity. This is surrounded by the event horizonat which the escape velocity equals the speed of light and that thus marks the outer boundary of a black hole. Nothing from within the event horizon can travel back into the outside universe; on the other hand, matter and energy can pass through this surface-of-no-return from outside and travel deeper into the black hole. For a non-rotating black hole, the event horizon is a spherical surface, with a radius equal to the Schwarzschild radius, centered on the singularity at the black hole's heart. For a spinning black hole (a much more likely contingency in reality), the event horizon is distorted – in effect, caused to bulge at the equator by the rotation. Within the event horizon, objects and information can only move inward, quickly reaching the singularity. A technical exception isHawking radiation, a quantum mechanical process that is unimaginably weak for massive black holes but that would tend to cause the mini variety to explode. A Schwarzschild black hole is characterized solely by its mass, lacking both rotation and charge. It possesses both an event horizon and a point singularity. A Kerr black hole is formed by rotating matter, possesses a ring singularity, and is of interest in connection with time travel since it permits closed time-like paths (through the ring). A Reissner-Nordstrom black hole is formed from non-rotating but electrically-charged matter. When collapsing, such an object forms a Cauchy horizon but whether it also forms closed time-like paths is uncertain. The equations of general relativity also allow for the possibility of spacetime tunnels, or wormholes, connected to the mouths of black holes. These could act as shortcuts linking remote points of the universe. Unfortunately, they appear to be useless for travel or even for sending messages since any matter or energy attempting to pass through them would immediately cause their gravitational collapse. Yet not all is lost. Wormholes, leading to remote regions in space, might be traversable if some means can be found to hold them open long enough for a signal, or a spacecraft, to pass through. What would it look like to fall into a black hole? Falling into a black hole might not be good for your health, but at least the view would be fine. A new simulation shows what you might see on your way towards the black hole's crushing central singularity. The research could help physicists understand the apparently paradoxical fate of matter and energy in a black hole. Andrew Hamilton and Gavin Polhemus of the University of Colorado, Boulder, built a computer code based on the equations of Einstein's general theory of relativity, which describes gravity as a distortion of space and time. They follow the fate of an imaginary observer on an orbit that swoops down into a giant black hole weighing 5 million times the mass of the sun, about the same size as the hole in the centre of our galaxy. As you approach, a dark circle is bitten out of the galaxy containing the black hole, marking the event horizon – the point beyond which nothing can escape the black hole's grip. Light from stars directly behind the hole is swallowed by the horizon, while light from other stars is merely bent by the black hole's gravity, forming a warped image around the hole. To distant observers, the horizon has a size of one Schwartzschild radius – about 15 million kilometres for this hole – but as you approach, it recedes from you. Even after you cross this radius, there is still a point in front of you where all light is swallowed, so from your point of view, you never reach the horizon. Hamilton and Polhemus have painted a red grid on the horizon to help visualise it (as the horizon is spherical, the two circles on the grid represent the north and south "poles" of its central black hole). And as you pass one Schwartzschild radius, another artificial visual aid pops up. The white grid that loops around you marks where distant observers would place the horizon – this is where you'd see other people falling in if they followed you through the horizon. The strangest sight is reserved for your last moments. So close to the centre of the black hole, you feel powerful tidal forces. If you're falling in feet first, gravity at your head is much weaker than at your feet. That would pull a real observer apart, and it also affects the light falling in around you - light from above your head is stretched out and shifted to the red end of the spectrum. Eventually it gets red-shifted into nothingness, so your whole view will be squeezed into a horizontal ring. This process might shed some light on a black hole puzzle. Quantum calculations seem to show that there is too much complexity within a black hole - in earlier work, the researchers calculated that it should be possible to create much more entropy (a measure of disorder) inside the black hole than is measured by outside observers. This is like a supercharged version of the old black hole information paradox, which pits the apparent destruction of objects - and information - that falls into a black hole against quantum mechanics, which states that quantum information can never be lost. The problem may be that we have a naive view of space, which breaks down inside the black hole. To calculate total entropy, Hamilton and Polhemus assumed that you add up all the possible states that matter and energy could take at different points in space. But along with other theorists, they suspect that this usual assumption, called locality, doesn't work inside a black hole. Somehow, different points in space seem to share the same states - but it's not clear how. That's where visualisations like this might just help. "Close to the singularity, it appears that the entire three-dimensional universe is being crushed into a two-dimensional surface," says Hamilton (see Our world may be a giant hologram). But whether it hints that a 2D view is more fundamental is not yet clear. "Does it have any profound significance? I don't know," says Hamilton.